For those who missed it, Bobby Sanabria’s pre-concert discussion on the history and fundamentals of Cuban music was worth the price of admission. Sanabria is a high-energy, hands-on drummer and educator with a deep understanding of the subject matter. He is intelligent, witty, funny, street-wise and thinks nothing of demonstrating a point – and making it stick – with his drum-kit. Above all, Sanabria is an artist in the trenches who practices what he preaches. As we filed out of the room reminded us of the fact that music is a science. According to Sanabria, “It changes your molecular structure!” How deep is that? Jazz at Lincoln Center kicked off its 2014 season with Ochas, an ambitious collaboration featuring pianist Chucho Valdés, master drummers Román Díaz, Pedrito Martínez, Clemente Medina and Wynton Marsalis and the Jazz at Lincoln Center Orchestra. 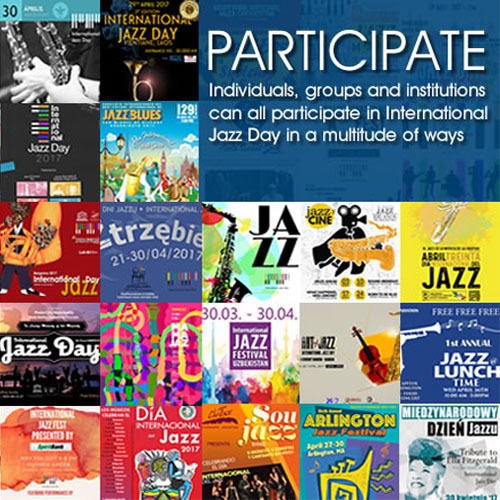 The project dates back to 2010 when leader, Wynton Marsalis and his 15-piece assemblage of virtuosos visited Cuba for a week long residency and series of performances that raised Marsalis’ consciousness about the links between American jazz and Cuban music, the main current of which is Africa. 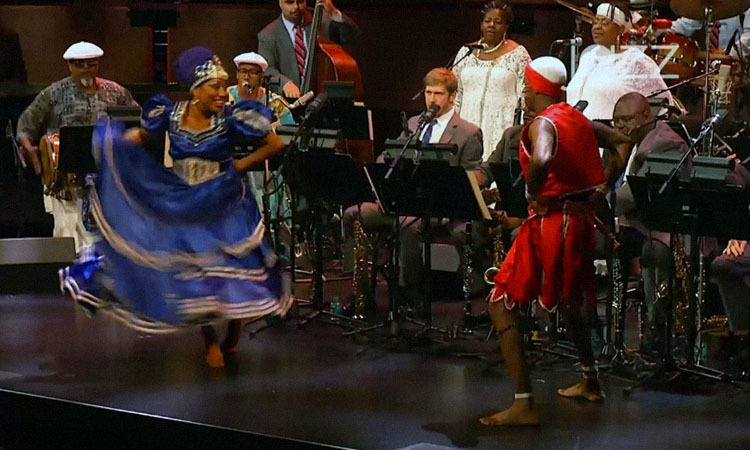 The end result is an ambitious and sweeping 8-part suite dedicated to the Orishas (deities) in the Yorùbá pantheon and a musical conversation between the Jazz at Lincoln Center Orchestra and the batá drums. Began with Moyuba, a salute to the ancestors and the introduction of the drums – Iyá, the leader or Mother Drum that calls for changes in rhythms and songs, Itótele – the middle drum that carries on a conversation with the Iyá drum and the smallest drum, Okónkolo that maintains the underlying beat and syncopated rhythms. In an ongoing conversation with the batá drums, the Orchestra played themes intended to invoke the deities, Eleguá, Ogún, Ochosi and Obatalá. It’s worth pointing out that in actual ceremonies, the dialogue is between the drums and the singer. In Marsalis’ reinterpretation, the conversation is between the batá and the orchestra. Pianist and 5-time Grammy Award Winner Chucho Valdés appeared in the segment devoted to Obatalá – The King of the White Cloth. His presence – which was all too brief – elevated the music, electrified the room and provided a bridge between the orchestra and the drummers. Included vocals (chants) and dance. As before, there were invocations for Oshún, Oyá, Yemayá and Changó and variations on the themes. Dancers Dresier Durruthy Bambolé portrayed Changó – the orisha of dancing, drumming, thunder and fire while Yesenia Fernández Selier captured the spirit and energy of Yemayá, who represents mother water and orisha of the oceans. At its best, the orchestra and the drummers came together in a joyous and seamless celebration of American jazz and Cuban music, however there were moments when Marsalis’ compositional style and the orchestra were out of sync with the drummers. Having said that, I applaud Mr. Marsalis for taking on such an ambitious project. Marsalis’ Ochas is the latest addition to a long line of performances featuring batá drums that dates back to the 1930s. The first lecture demonstration with batás was with Fernando Ortíz at the University of Havana in 1936, followed by a Gilberto Valdéz concert in 1937. It took another seven years for orisha songs to be heard on the radio, performed by singer Merceditas Valdés. In 1952, the great pianist, composer and bandleader, “Bebo” Valdés, featured the batá with his big band in a rhythm he called batanga. Twenty years later Chucho Valdés created his own version of the jazz piano trio by using batá instead of the standard drum-kit. Two exceptional artists who have a deep understanding of jazz, Cuban folkloric music and religious music are drummer, composer Francisco Mora Catlett, leader of Afro Horn, and pianist, composer and leader of New Yor-Uba Michele Rosewoman. New Yor-Uba reflects the progression of the ancient Yorùbá people from Nigeria to present day New York through the use of brass, saxophones and a rhythm section, three batá and conga drummers. Catlett, a veteran of the Sun Ra Arkestra, approaches the music from a more avant-garde stand point and African-centered view. Interestingly, Afro Horn and New Yor-Uba share the genius of Román Díaz. Kudos to Fernando González for his interesting and enlightening program notes. Since the 1990s, Jazz at Lincoln Center has celebrated Cuban music with collaborations with Celia Cruz, Israel “Cachao” López, Candido Camero, and Bebo Valdés, including a landmark Jazz at Lincoln Center Orchestra residency in 2010.